I made some 'bearing plates' to make it easier to check and set the alignment adjustments. They are made from 8x16 pieces of 1/4" steel flat bar. The bearings are contained by a cage made from 1/4" MDF. This works very nicely. Set the car down on the plates and the suspension can move freely. I can turn the steering easily with almost no friction. As expected it looks like all the suspension bushings, shocks and springs are original 1980 stuff. Not in bad shape considering the age but still in need of freshening up or upgrading. In addition to the Fiero seats I installed a new gray carpet kit over the layer of 3/8 neoprene foam I had put down. Also, new inner door panels and all the old wine colored interior parts were painted with vinyl paint. New seat belts, steering wheel. I made new panels for the sides of the transmission tunnel. All the new gauges are installed in the ABS panels I made for the dash. The original Corvette seats leave a lot to be desired. They are narrow feeling (at least for me!) and do not have any adjustment for the angle of the seat back. Pontiac Fiero seats are a popular source for a seat swap so that's what I decided to try. The Fiero seats are much more comfortable and the seat back angle is easily adjusted. I just happened to find a pair in dark and light gray that match the new interior pretty well. I had to make new seat brackets to bolt them to the original bolt pattern. I had to make up a 'squaring jig' to ensure the brackets lined up with the holes in the floor. The new drivetrain needs a different combination of gauges. For the most part the original gauges are not functional due to age and corrosion. So, the plan includes a complete new set of VEI Systems digital gauges to be installed in new handmade panels in place of the original clusters. 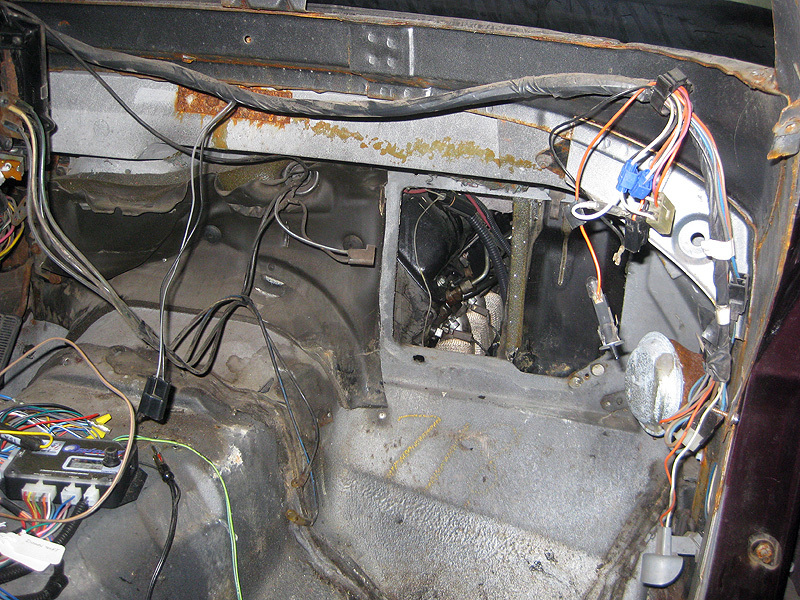 I removed the speedo and tach and took the cluster housing to the bandsaw and slices off the rear of the meter housing. I laid out the shape on the new gauge panel in AutoCad and cut it out in 1/8" ABS plastic. With ABS pipe glue and epoxy I put the new panel into the front of the original housing. I did the same with the center console gauge cluster. I removed the gauges. Then I cut all the original gauge faces out of the panel leaving about a quarter inch border to bond the new panel to. I have the new gauge clusters temporarily connected to verify the wiring connections. The old "wine" colored interior is definitely showing its age. I decided I will replace the carpet and door panels with some "charcoal" interior pieces that were used in the 81 models. Some parts that are in good condition will get dyed with SEM Color. In fact I'll try the dye on as much of the interior as I can to keep the cost down. Well, the project has been stalled for a while. 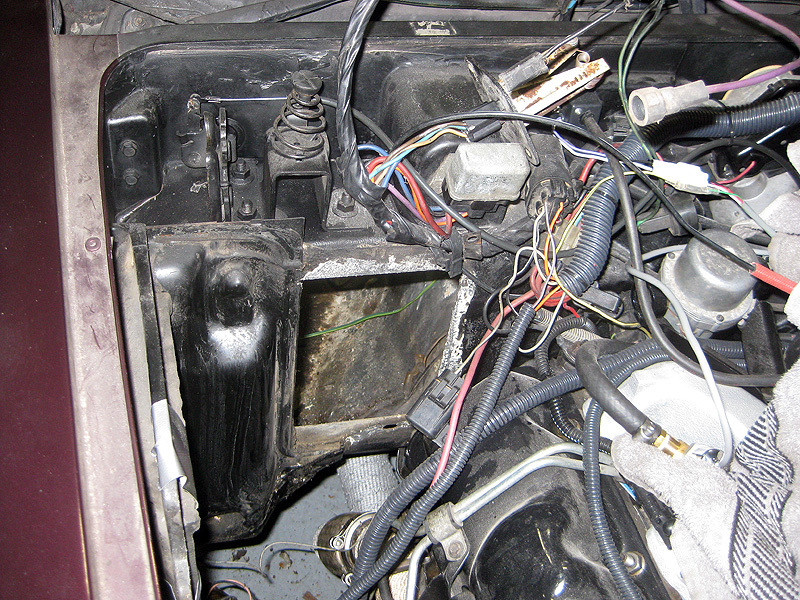 The car needs a new heater core and I figure while I'm in there I'll also replace the AC evaporator. Here's the new evap. You can't do the job without tearing the dash out so everything has to come out. 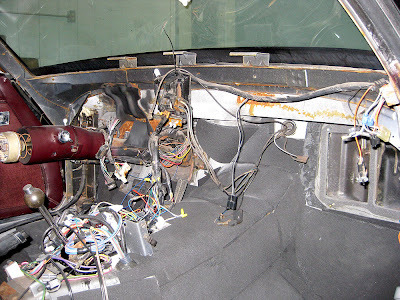 With the dash, seats and carpet out this is the best time to work on controlling noise inside the car. I got some 3/8" thick neoprene foam sheet and cut and glued it in place. In spite of being a diesel this car still has to be fun to drive like a sports car. That's where the aftermarket transmission controller come in. I chose the "Quick 1" from US Shift as it looked to be the best value that still had all the features I wanted. This controller was also sold under the "Opti-Shift" name. The controller came loaded with a diesel shift point program that was probably just fine for a pickup but needed a little adjusting for the Corvette. Making changes in the shift parameters is easy. You connect a laptop with a USB cable, pull up the program, make adjustment by moving points on the upshift and downshift lines based on throttle position and speed. The Quick 1 will hold 2 different shift programs that can you can choose between with the flip of a toggle switch. It also can be put in manual mode and has inputs for paddle shifters. I've connected wiring for the lift pump and injection pump solenoid. It starts and runs! Yay!! I've been putting this off because I didn't have a good plan for getting the oil drain from the turbo back to the motor. I thought I was going to run the drain line into the unused crank position sensor hole in the timing cover. That wasn't going to work because there just isn't enough room work. I ended up running the oil drain straight back and welding an elbow into the oil pan. It's a very tight fit. There's only a little more than 1/8" clearance for the power steering pump pulley and exhaust pipe going into the turbo. I'll add some kind of sheet metal heat shield between the oil drain and exhaust just to be on the safe side. Getting oil to the turbo was a bit simpler. I was actually able to use the stock GMC oil feed line. I had to 'unbend' the turbo end of the line a little and rotate the fitting in the hose crimp. I fabricated a block with a piece of 1/8 pipe bent to clear the turbo output elbow. In the process of laying out the dump pipe for the turbo I realized that the steering idler arm was going to make the exhaust routing difficult. On right hand turns the idler arm swings into the space I wanted to use for routing the pipe. Yeah, the pipe could be made to snake around it but it was going to be tricky getting it right. I had planned (later on in the project) to toss the stock steering system and replace it with a Steeroids rack and pinion kit. I didn't want to do that until after the car was drivable but the kit eliminates the idler arm and frees up space for the exhaust pipe. So, on goes the Steeroids kit so I can get on with finishing the exhaust. There's the rack. It's so much nicer than the original steering box and hydraulic cylinder. Installation was super simple an easy. That hardest part was working the old steering box out from between the left exhaust manifold and the frame. Now there's just enough room for the exhaust to pass between the motor mount and steering rack without a bunch of additional bends. It's more fun to work on stuff that shows. It makes it look like progress in being made. 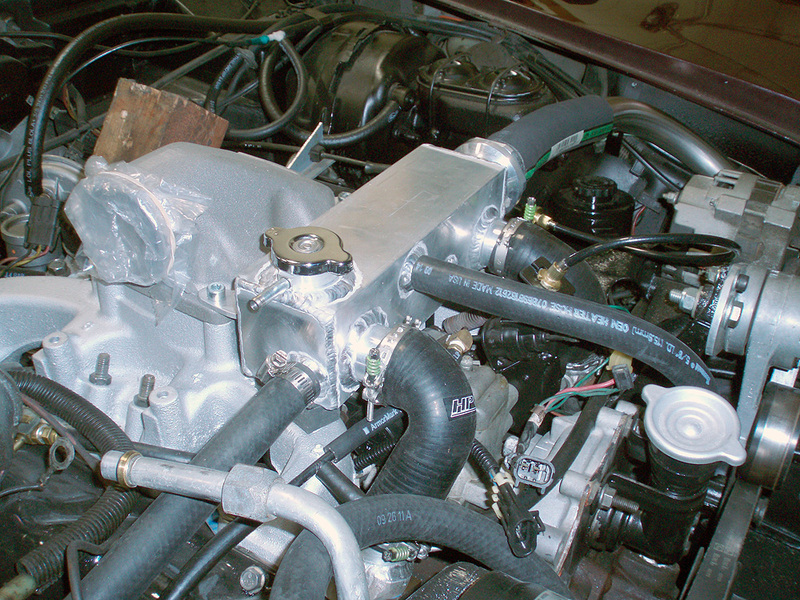 The turbo is in place and the intake tubing is arranged. Next I have to get fresh cool air into the turbo. I made a panel that mounts where the original radiator did just above the top of the new radiator. The new panel will hold a big K&N air filter (from a Lamborghini) and route filtered air from in front of the radiator directly into the turbo. That means having a pretty tight 90 degree elbow that has to clear the left side upper control arm and the upper radiator hose. After collecting a big box of metal and plastic elbows to try to modify I decided I had to fabricate the elbow out of fiberglass. Starting with a flat sheet of Styrofoam, I cut a bunch of 4" diameter cookies with a hole saw. Then I sanded each cookie into a wedge. It was pretty simple to glue the wedges together to form approximate shape of the elbow. After hours of gluing and sanding and test fitting I covered the foam plug with fiberglass and epoxy resin. With a couple more layers of fiberglass and lots more sanding and shaping We have an elbow. It fits just right and has the clearance it needs. The 6.5 has a big Y shaped casting to route water exiting the cylinder heads through the thermostat and on to the radiator. It also has hose connections for the thermostat bypass and heater supply hose. My problem is the stock water manifold is too tall. With it installed the hood can't close. 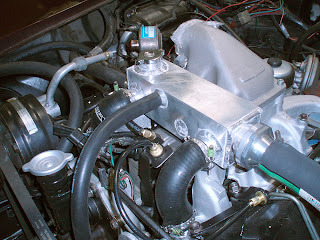 In addition the filler cap needs to be the highest point in the system. With the radiator mounted so low I would have to fab an additional filler of some kind at the top of the water manifold. 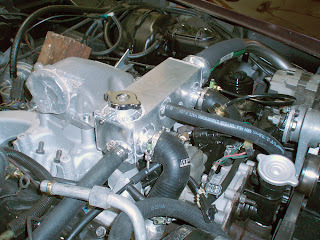 Several attempts to modify the stock manifold were not satisfactory so I decided to fabricate a water box. So far, so good. It's got all the necessary connections, the filler is at the top so it will be easy to purge air from the system. There is a baffle inside to help mix the water from left and right heads. The thermostat is inside the big fitting on the left of the photo. The fitting unscrews and the thermostat fits inside. It's taken quite a long time to get the most critical part of the exhaust system fabricated. There's just barely room for the necessary piping so precision was critical. Finally all the exhaust that connects from the exhaust ports to the turbo inlet is done. Exhaust crosses over from the right side to the left and then runs forward to the turbo in front of the engine. Here it is assembled on the floor. It's welded out of 1/8" thick stainless steel tube with v-band connections to ease installation and flex couplings to avoid cracking from heat stresses. I used up a lot of time and stainless steel tube making parts that weren't quite good enough. The first attempt at the manifolds warped so much during welding that I just had to scrap them and start over. I learned a lot about welding stainless though so it wasn't a complete loss. The next step is to wrap it up with exhaust wrap and then it can be bolted up.